My Wine of the Month for October is Grangehurst Pinotage 2008. Jeremy Walker, owner/winemaker of Grangehurst doesn’t release his wines until they are ready. 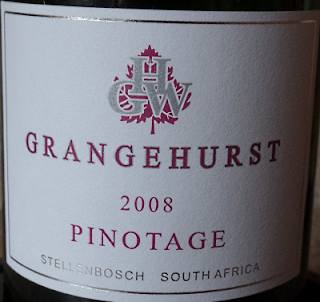 Thus this 2008 Pinotage, that I bought last month, is the most recent vintage and had just arrived in the UK from the Cape. When I tasted the 2007 at the London Wine Fair in June (see here) I wished I’d had it with food. Well, I enjoyed the 2008 with dinner. 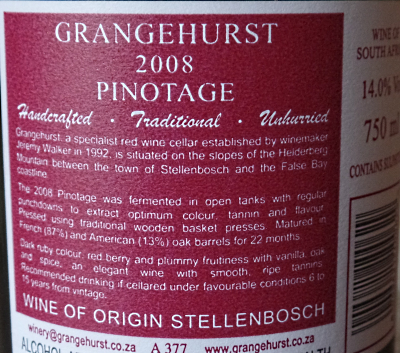 The 2008 is 88% Pinotage with 10% Cabernet Sauvignon and 2% Merlot. It’s Grangehurst tradition to blend in a little Cabernet, dating from Jeremy’s maiden Grangehurst vintage in 1992 when he didn’t have enough Pinotage to fill a tank. It was so successful he’s done it ever since. 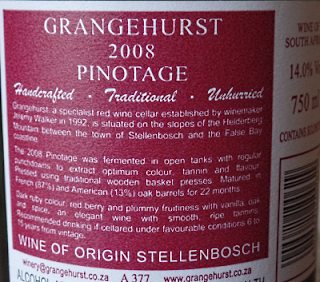 Pinotage was sourced from vineyards in Firgrove/Helderberg and Simonsberg. After destalking and crushing the grapes, the mash was fermented in open tanks for 5 and 7 days on the skins. The cap of skins was punched down 4 to 6 times per day then basket pressed and blended with the free-run wine in stainless steel tanks before being transferred to small oak barrels. Malolactic fermentation occurred in tanks and barrels. This wine was clarified by natural settling and racking, without fining agents, centrifuges or filters – a natural, unhurried method of clarifying wine. Portions of the Pinotage wines from the two vineyards were blended and barrel matured, whilst another portion (Firgrove/Helderberg) was barrel matured as a single vineyard. The wines spent an average of 22 months in 225 litre French (87%) and American (13%) oak barrels. The two Pinotage portions were racked and blended in a stainless steel tank together with a few barrels of Cabernet Sauvignon and a splash of Merlot. Bottled at Grangehurst using a gentle gravity flow filling system, the wine flowed from the elevated bottling tanks through a cartridge filter to the hand filler and into the bottles. This was the only stage during the entire winemaking process that the wine was filtered. There was a melange of berry fruits on the palate, a hint of mint, and soft tannins on a long finish. This is a smooth sophisticated wine and delicious partner for dinner.